Today I made 3 trades, one was exited on loss. But several lessons to learn from these trades. I will also give a trade which I avoided today which will give the readers on how to avoid getting trapped in broker calls. 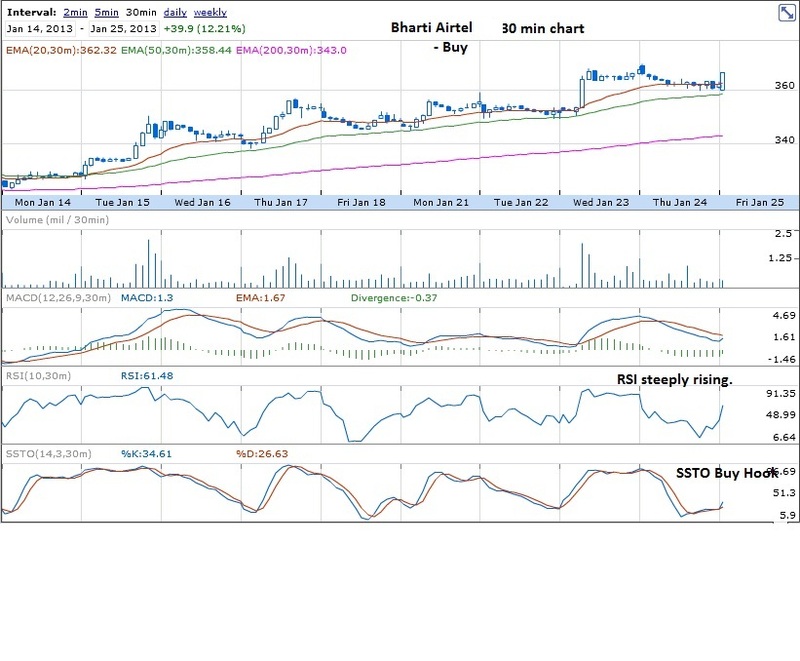 Today morning, I saw several buy calls on Bharti Airtel from brokers and overall the sentiment on the stock was good from past two days. So I decided to watch. 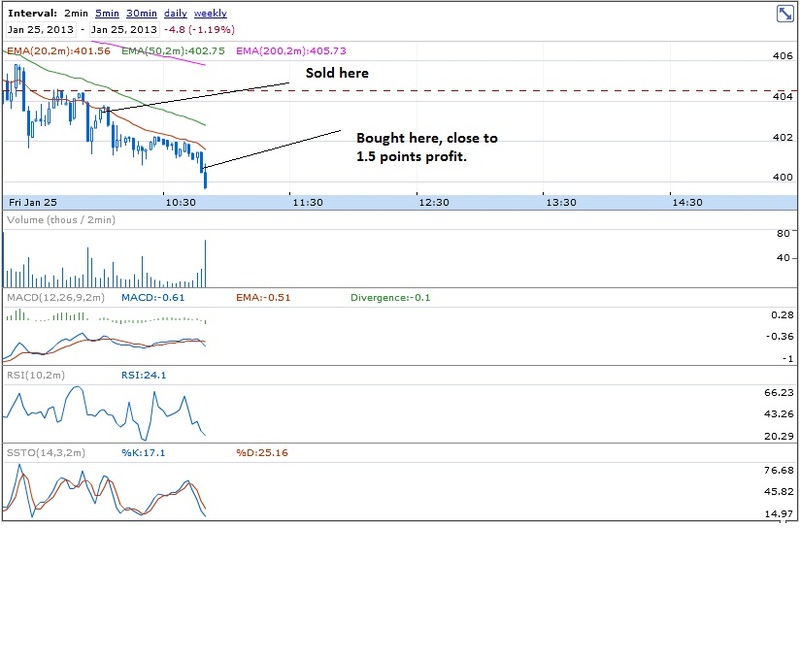 After I bought the stock, it started consolidating. 1. When a stock starts consolidating, watch where the indicators are moving. If indicators are horizontal, then it is a normal consolidation. Nobody knows which direction the stock moves after consolidation. 2. If the stock consolidates , but indicators move in a specific direction, then there is a high probability that the breakout will be in the direction of the indicators. 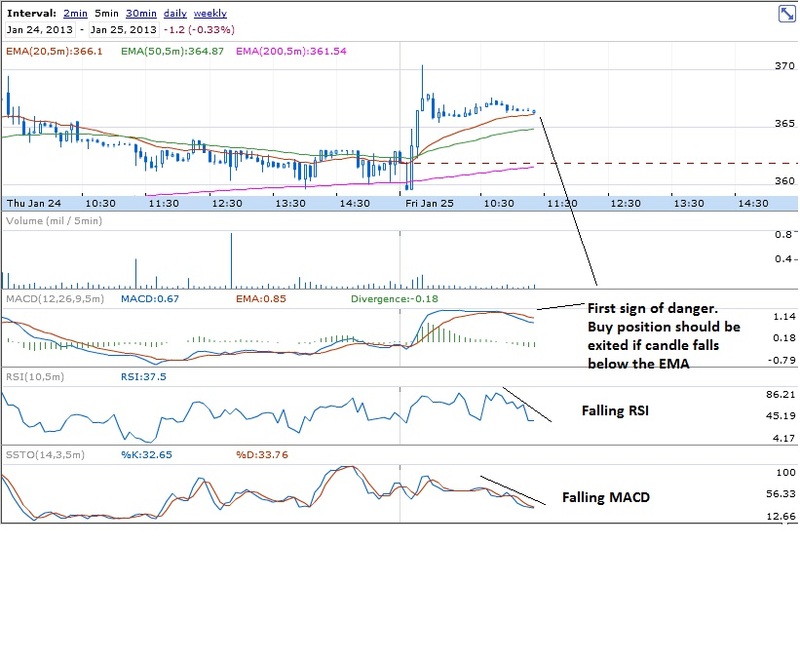 I observed the danger sign in 5 min charts, so opened the 2 min charts and started watching. 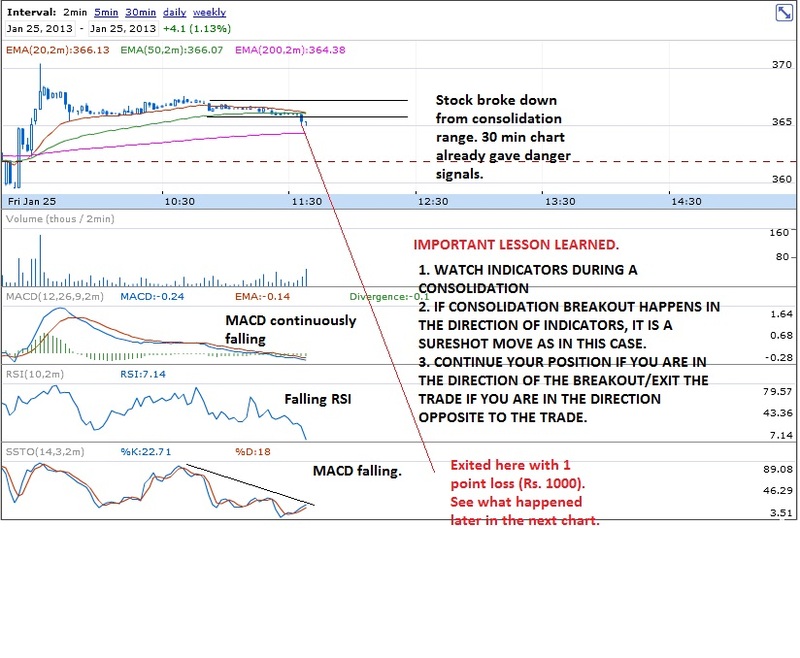 I saw a break down in the 2 min charts, so immediately exited with 1 point loss. See what happened after exit. The stock never went above the days high. 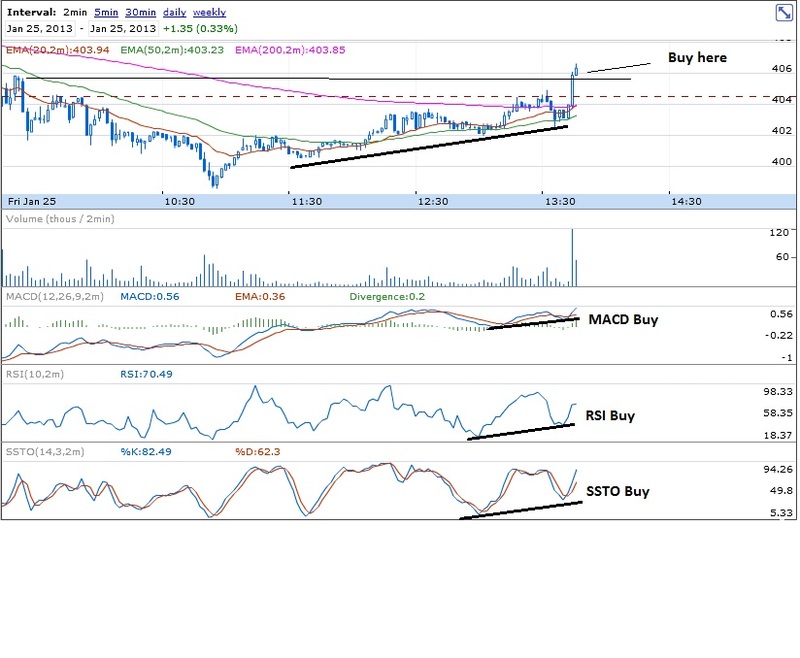 Ideally I should have bought only after the stock moves above day;s high. 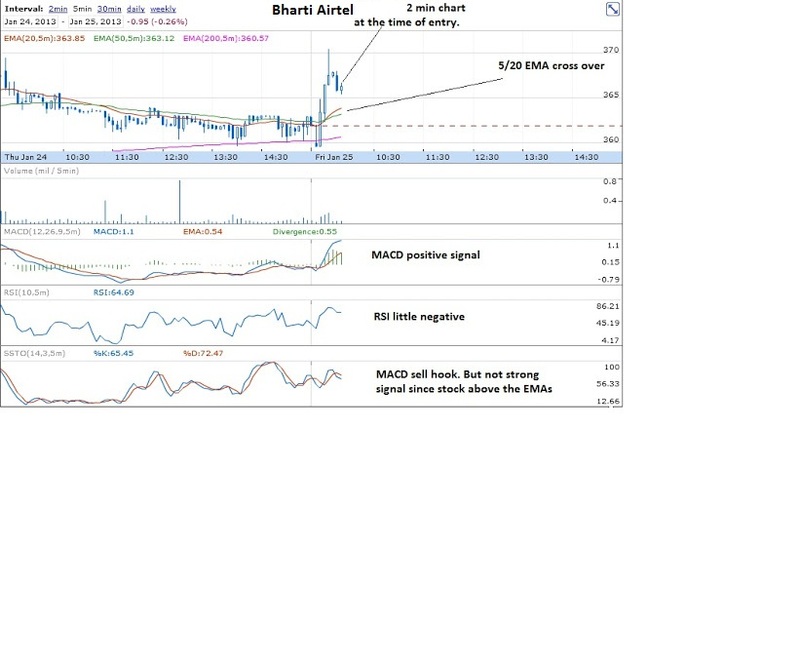 But since the momemtum was good for Bharti Airtel, I still entered the buy position thinking that it will cross day;s high. Later the stock crashed. !! See below. 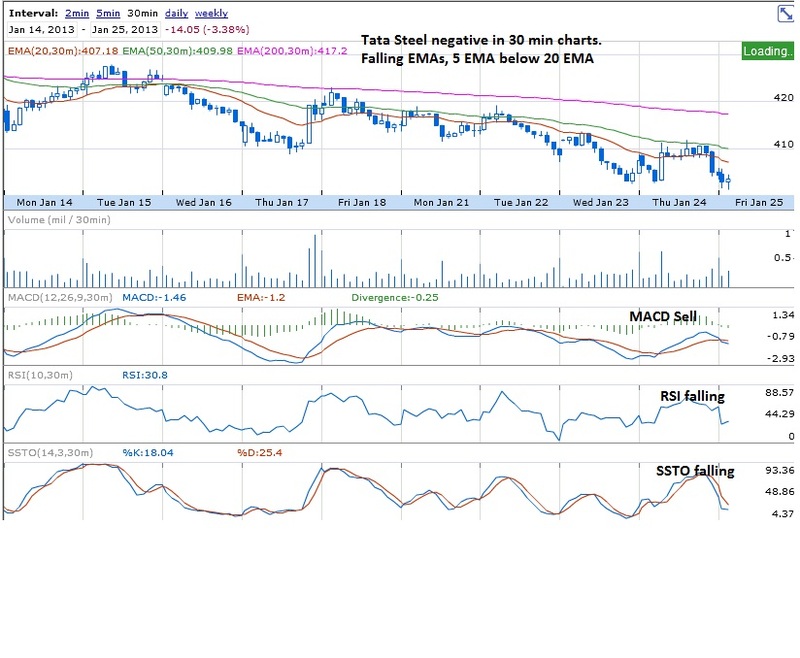 Tata Steel was overall weak from past few days. 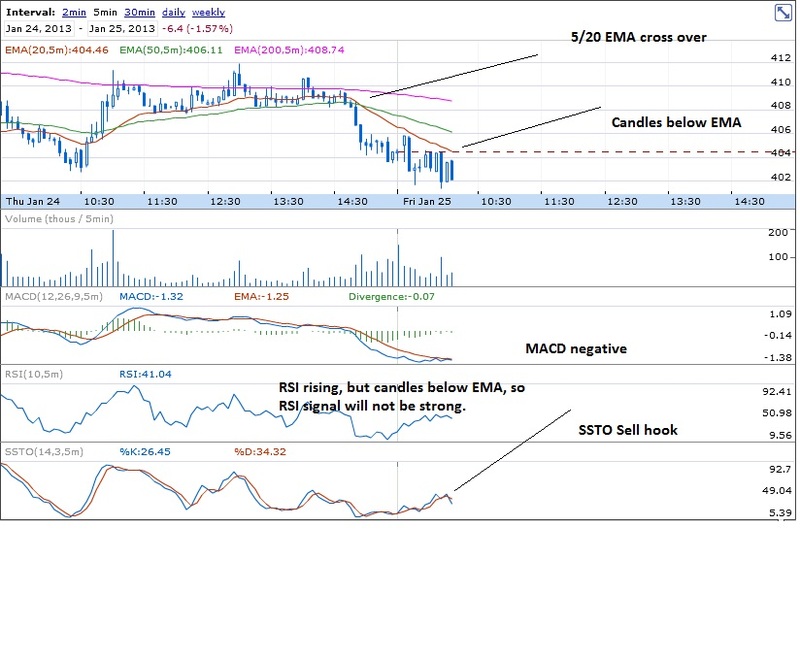 30 mins after the market opening, the stock was weak and all indicators gave sell...so I shorted. I had checked the immediate support of tata steel, that was 399, so I know that the stock will not fall easily below that. See the charts. 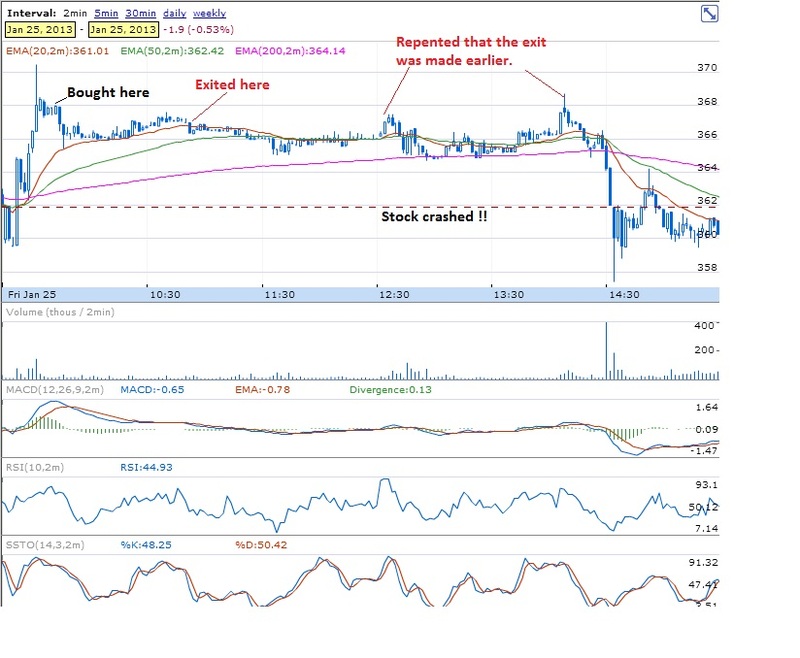 After I exited Tata Steel, I kept watching the stock and it started bouncing from the support. I did not want to enter since the stock was weak. But Nifty started recovering, and I waited to see if Tata Steel crosses days high. It did cross. I waited for a second candle above days high in 2 min charts and went long. Subsequently all brokers started giving buy calls. 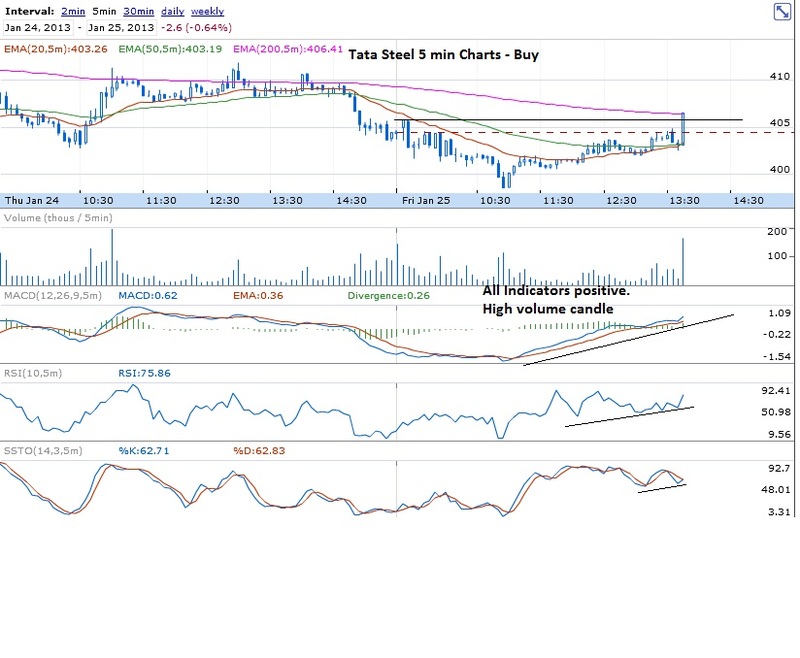 In the next chart of Tata Steel, I am explaining the very important concept of Stop Loss. 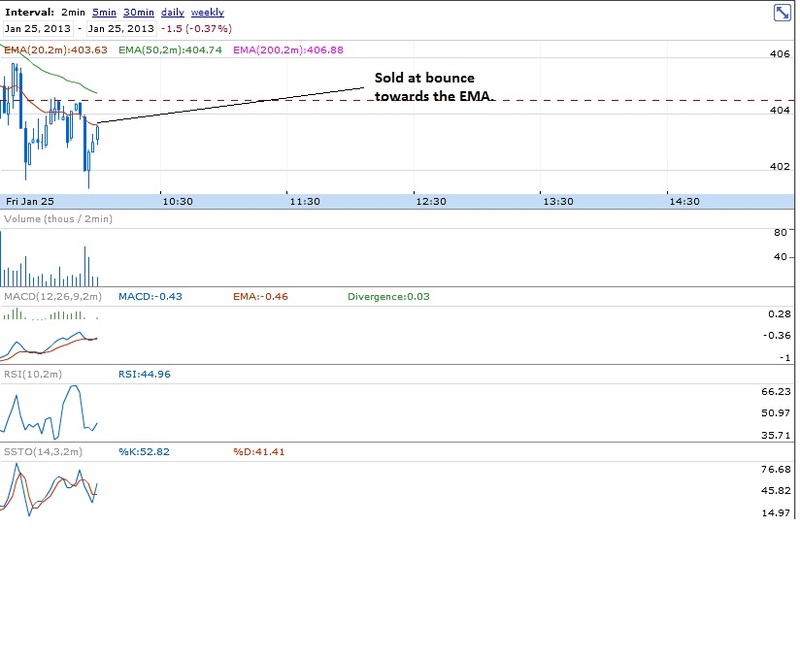 Here I had two stop losses, A and B from where the stock bounced before moving up. The stock did not touch any of these SLs before moving up. See the charts. 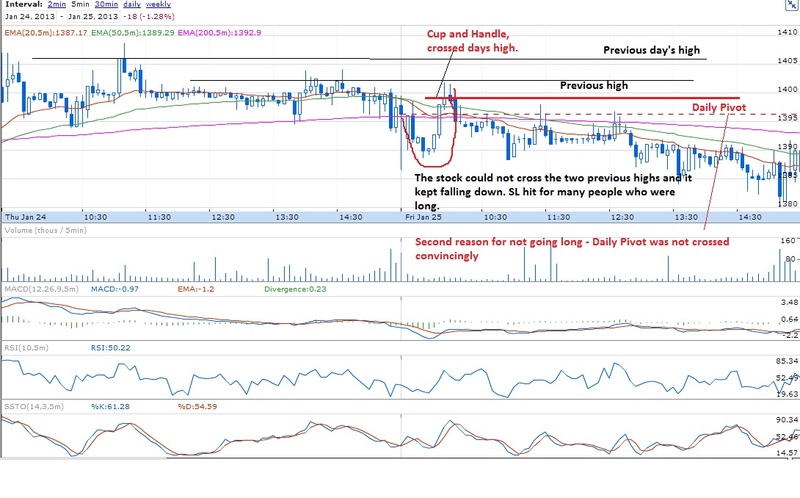 Today I avoided buying Axis Bank by following important concept of Support / Resistance. Several brokers had given buy call for Axis Bank. I do not know the reason why it did not move up. But charts had given indication that the stock will not move. 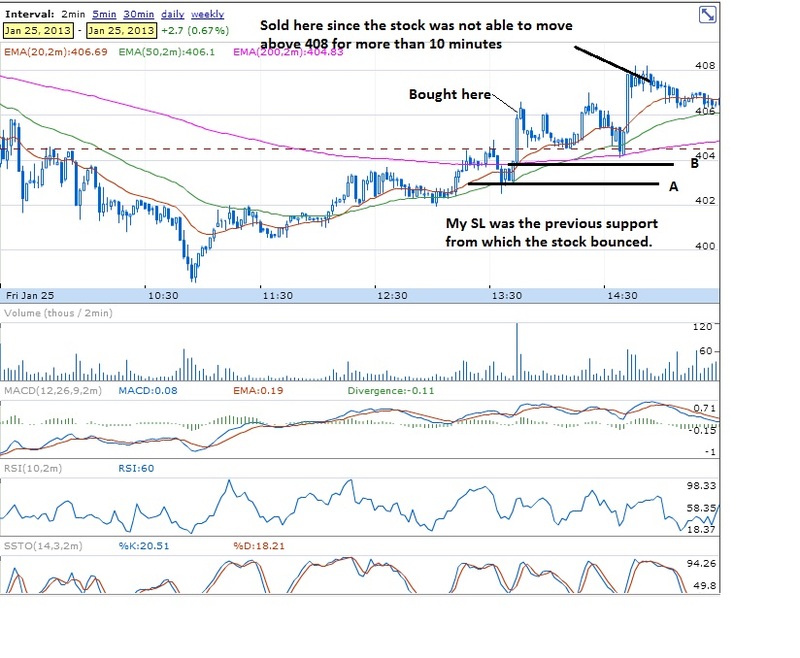 Read about Support /Resistance from any site before proceeding. Below points are important for day trading. 1. Previous high on the same day is a resistance. 2. Previous low on the same day is a support. 3. Previous day's high is an important resistance. Once crossed, many people will come forward to buy. 4. Previous day's low is an important support. Shorters come in tons if that is crossed. 5. Also check the support and resistances (the points where the stock paused) in the last few days, this could also be important turning points. Now read about Axis Bank from the charts. Hi, thanks for posting these trades. Analysis is excellent and good source of learninig.